Amara Wellness Centre is unique in Australia for its wellness-based, organic and authentic Turkish Hammam bathing facility and Hammam rituals. You may ask…what exactly is a ‘Hammam’ treatment? Essentially, it is a hot Turkish steam bath followed by a beautiful and relaxing massage - which works on strengthening the immune system and clearing the airways. It involves full body ‘kessa’ exfoliation to remove all the dead skin, soap massage relieving all the tension in the muscles, and a full body clay mask to get all the toxins out. Following this, a massage oil is applied to give the body, soul and mind its much needed healing journey and a “out of body experience” like our clients describe it. 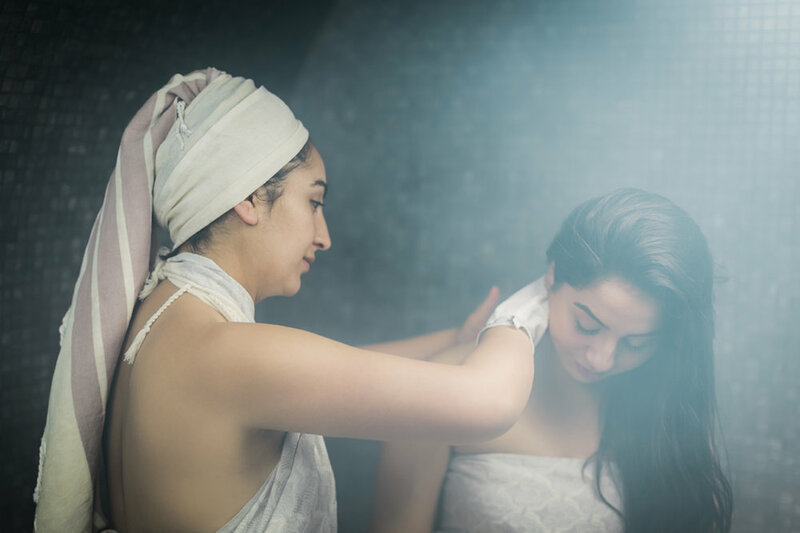 Overall, the skin is a reflection of our internal, so really the hammam experience is a therapeutic treatment and deeply healing, cleansing and rejuvenating. Inspired by Ancient Bathing Rituals and the Science of Integrated Wellness, our treatment menu offers something for every ‘body’. Our exceptional therapists are trained by Dr Zara herself, to ensure that every Amara journey is touched with warm hospitality, generosity of spirit and results you will remember. As an exclusive offer for 2019, if you book a Hammam Bathing Treatment at Amara today, you will receive a FREE Rejuvenation Polychromatic PhotonSmart LED to beautify your face (valued @ $140)! Book your spot now - limited spots available for this special offer! Hammam rituals relax the mind, release muscular tension, detoxify the body, increase circulation, stimulate the lymphatic system, increase metabolism, cleanse and exfoliate the skin, improve texture, tone and hydration of skin, relieve stress, promote mental clarity, increase energy levels and promote general wellbeing. Upon arriving you will be escorted to the relaxation area where your refreshment and consultation form will await. You are then invited to enter the change room and put on a silk/cotton pestemal, which is a special Hammam bath wrap, before stepping into your private Hammam, where you will take a warm shower and then relax in the steam for 20 to 30 minutes. After a little time to pause, reflect and breathe, your Hammam therapist, otherwise known as a tellak, will guide you through your chosen experience. This is your time to relax, rejuvenate and restore. The Kessa glove is a traditional exfoliation glove that cleanses and polishes the skin. The Savon Noir is a black soap made from olive oil, which provides a silky luxurious feel to the massage. The mineral rich Rhassoul Clay, used in Amara’s hammam rituals, is imported from the Moroccan mountains, and our products for hair, face and body are made by Phyts, leaders in certified organic performance products. After all time has stood still and once complete, you are again invited into the relaxation space to delight in a platter of wellness snacks and refreshments with our compliments. Note: If you have chosen to add an additional Facial, Massage or Advanced Health & Beauty Therapy you will be escorted into one of our specialised rooms for this next part of your ritual. You are welcome to enjoy your wellness refreshments whenever it feels right for you. We are at your service. Close your eyes, still the mind and slip into the blissful warmth of your very own private steam room. Benefits: Alleviates stress and tension, eliminates toxins, increases circulation, clears sinuses, soothes muscular aches, improves skin quality and deeply relaxes the mind/body. Relax amidst gentle swirls of warm steam that soften the skin, prior to receiving a rhythmic full body Kessa exfoliation for deep cleansing of the skin. Warm water is then poured over the body before your choice of aromatic massage oil is applied to leave the skin nourished and glowing. Additional Benefits: The kessa glove and body oils deeply purify, cleanse and hydrate the skin. Step into the enveloping warmth of the steam cavern and pause; be still. Then surrender to a traditional cleansing ritual using a Kessa glove for skin exfoliation, followed by a luxurious black soap massage before streams of warm water complete this indulgence, and leave mind, body and soul relaxed and aglow. Additional Benefits: The soap massage releases tight and tense muscles. Dissolve into the ambience of the steaming hammam, before receiving an invigorating full body Kessa scrub and a pampering Savon Noir soap massage, which prepares the body for the healing properties of the warm Rhassoul clay. You are left to drift and dream and after some time a relaxing shower is followed by the application of an aromatic oil to leave skin silky smooth and completely nourished. Additional Benefits: The clay wrap detoxifies the body and balances the skin. Breathe and relax in your private steam room, prior to receiving a gentle foaming exfoliation, followed by cleansing streams of warm water. This hammam ritual continues with the beautiful feeling of hot stones and savon noir soap, gliding over the body to deliver deep tension dissolving to muscles and mind. Completed with another rinse and the application of organic massage oil, you are left restored and relaxed. Note: These additional indulgences are performed in the Hammam steam room. Nourishing argan oil is massaged into the scalp and a conditioning masque is applied to the hair. Hair washed, cleansed and conditioned with certified organic Phyts products. Refresh tired skin with a facial cleanse, compress, exfoliation, face masque and moisturiser. Following your luxurious soap massage, specific attention is paid to the reflex points on your feet. The silky slip of the soap combined with the foot massage provides a deeply satisfying indulgence for tired feet. Once your silky soft soap massage begins you will wish it never ends. Your skilled therapist will spend more time relieving areas of tightness and tension so that you are left even more relaxed than you can imagine. Slippery black soap and hot stones combine to offer an exquisite massage experience to relieve tired and tense muscles and relax the mind. Add one of our specialised face or body therapies to complement the result of your Hammam experience. Choose as many therapies as you like or speak to our wellness advisor who will happily recommend the best choice of treatments to target your desired result. Note: These additional indulgences are performed in one of our treatment rooms, not in the hammam. We are delighted to create bespoke experiences that bring together our Hammam Rituals with the most popular and effective ‘add on treats and therapies’. This deluxe ancestral ceremony unfolds as a mosaic of indulgences with; a relaxing steam therapy, a warm argan oil scalp massage and hair masque, a skin cleansing kessa body scrub and savon noir soap massage, a mini facial to refresh tired skin and a detoxifying full body rhassoul wrap. After a cleansing shower, aromatic oil is applied to the body and a moisturizer on the face to complete this journey to bliss. Escape to a faraway land with an indulgent hammam ritual that completes with a deluxe organic facial. Mind, body and soul is completely revived and refreshed with this exquisite combination of hammam therapies that nourish hair and scalp, purify and hydrate skin, soothe muscular tension, detoxify the body and rejuvenate the complexion. This restorative head to toe treatment begins with a highly effective Endermotherapie massage, which treats muscular tension and injuries, fluid retention, inflammation, scarring and a number of other conditions. You are then escorted into a deeply relaxing and purifying hammam ritual, which ends with a tailor made deluxe organic facial to plump, firm and revive a youthful complexion. For further information about Amara Wellness Centre's Beauty Program or to make an appointment, call Amara Wellness Centre on (03) 9388 2828 or click the button below to book online.